The month of September brings plenty of opportunity for reigning in habits that have gone astray, like making pie all the time. Just kidding. You know, I haven't been making pies because I have been on a diet since April, the revolutionary LA LA LA LA I can't hear you diet. The diet is only temporary, but the other habits like daily exercise, eating lots and lots of simply prepared vegetables, and special treats every once in a while instead of whenever the spirit strikes me are all sustainable ones I am working hard to hold on to. Before we went visiting and touring in August, I was meeting weekly with my belle sœur (sister-in-law) Anne for lunch. She is a hat designer. We both live in Lyon now, and as time goes by we both realize that it would be a shame not to profit fully from this cross in our paths. She is still relatively itinerant, in her mid 20s. Hopefully we will always live close to one another, but you never know what life can bring. We know this because Aude's trajectory took her to the Auvergne where they have settled down near Seb's mother. Even if Aude and Seb are still within a few hours' drive from us, it takes an effort to meet now. It was very easy when we were all in Lyon, but we really didn't meet enough. Anne and I don't want to regret not having fully enjoyed one another now, so we've made it a point to meet, even just the two of us. We called and asked Anne and Greg to come for dinner, and we hadn't thought about dessert. 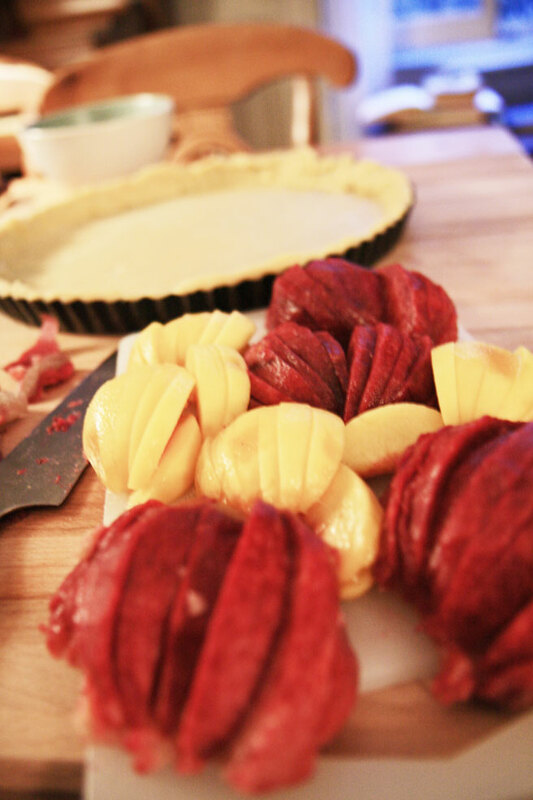 Being late Sunday afternoon, swinging by the bakery to choose something just for them was out of the question, so I fell back on the old standby to make a kitchen table tarte with what I had on hand. A fresh bunch of verbena, 2 pêche de vignes that we'd got from a producer in the Coteaux des Lyonnais, and 2 little yellow peaches. This year the fruits are very red! There is no recipe. You make a pâte brisée. 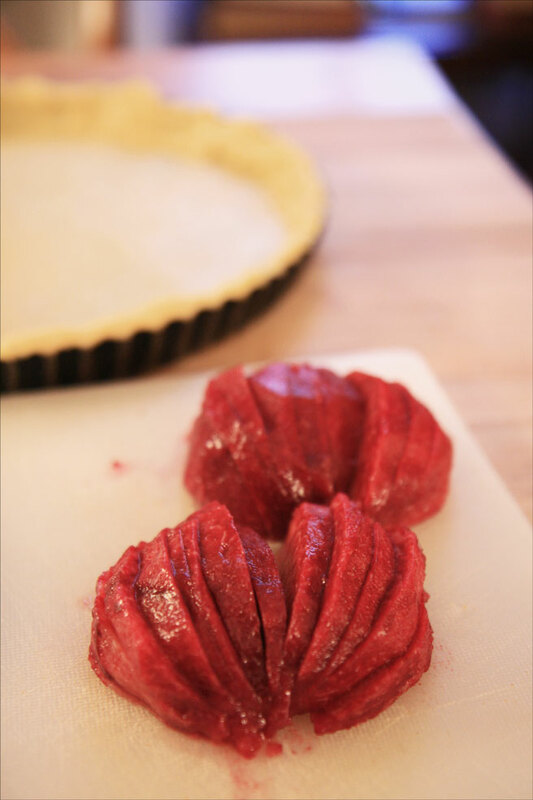 Of course you probably have your favorite pie crust. It doesn't have to be a sweet one. Fresh verbena makes a wonderful syrup, for which I gave you instructions here. A 1/2 cup of this syrup mixed with about 60 grams of farm fresh cream cheese (aka cream cheese) and an egg was all I needed to fill in nicely when we ran out of fruit. 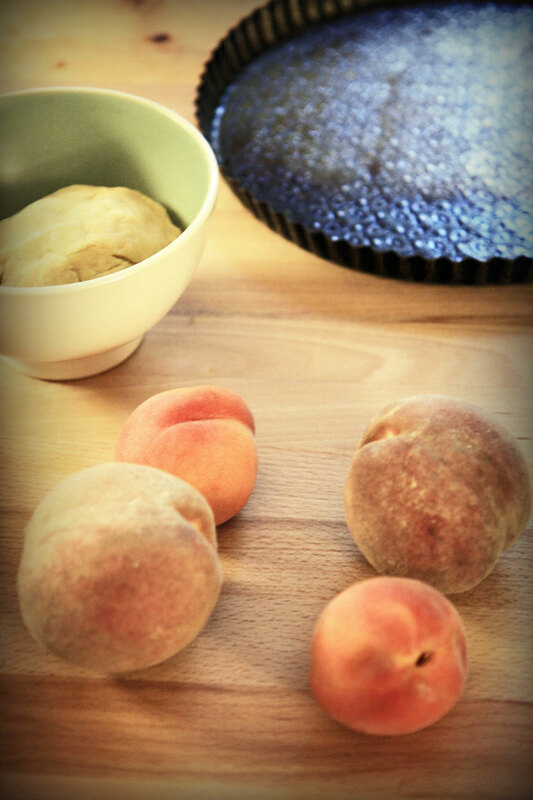 I sprinkled the peaches with sugar and placed the tarte in a nice hot oven until the top was brown. The big challenge is to stay away from it today. I enjoyed a sliver, and they had seconds, and the remaining pie after Loic had his share for breakfast is wrapped in foil on the kitchen table. I am noting the marriage of verbena and peach in my kitchen notebook. It is something I will do again, perhaps next time poaching the peaches in verbena syrup and serving them cold with chantilly. Haven't been around for your last 3 posts. Have been catching up -- especially enjoyed the post on Strasbourg. Beautiful photos! 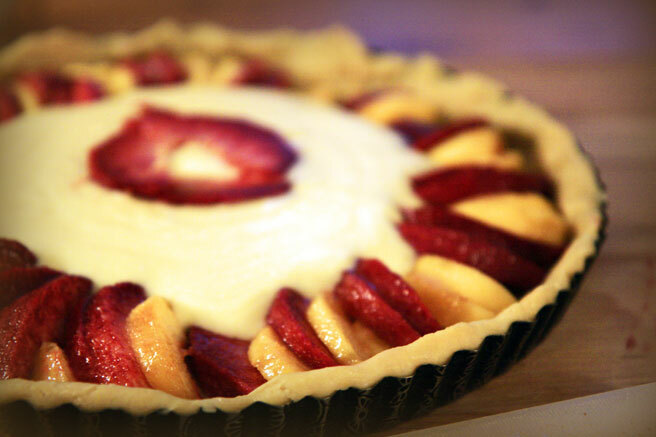 What a lovely looking tart! And what willpower you have! Love those pêches de vignes - so dramatic looking. God, that's a lot of work for a food blogger: dieting AND posting lovely recipes...You must find someone to eat all this fantastic food! Thanks for coming by! I am absolutely obsessed with the food here in Lyon, no need to worry about that! Lucy, I just posted a link to an old post of mine in which I made your pate brisée. I am printing it out and bringing it to France with me, which may yield interesting results. Our little village has no wireless, so I'll have to post about it when I return in October. Looks like pizza. No kidding. Tastes like pie. 'Less yer trippin, man. Your blog is absolutely stunning and quite amazing.I love everything here.